Containment Protocols: RPC-056 is to be kept in a standard containment locker at Site-002. All on-site staff are to maintain dream journals. Any staff reporting odd dreams are to be directed to the Lead Researcher for interviewing, followed by application of Class B EGs, and the deletion of the relevant log from their journal, a fabricated dream in its place. Any tests involving RPC-056 are to be conducted only with permission from the Lead Researcher, and the use of CSD in experiments involving the object is forbidden. Senior Staff members may request an exception to the application of amnestics, provided the dreams granted to them are not detrimental to the Authority. Those granted this exception are to be closely monitored, with psychiatric examinations delivered once per month. 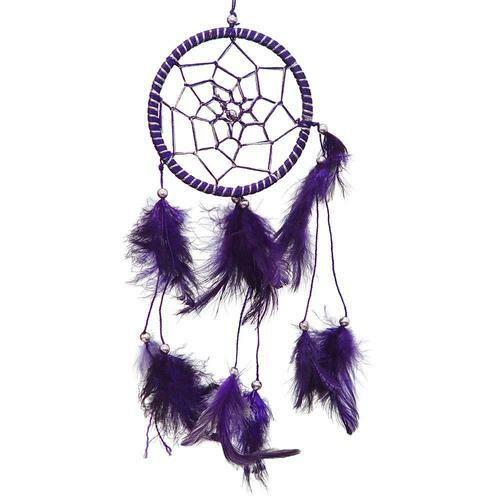 Description: RPC-056 is a dark purple dreamcatcher, noted to glow faintly after sunset in its area, regardless of actual lighting conditions. Occasionally, sleeping humans within a radius of roughly two kilometers will be affected by RPC-056. The effects of RPC-056 will always apply to anyone sleeping underneath the dreamcatcher. Those affected by RPC-056 experience vivid dreams, labeled collectively as RPC-056-1. Dreamers always report RPC-056-1 as living through several hours of a day in their lives, like themselves, but under different circumstances. The exact details of these circumstances are usually different, though some tests have displayed that certain subjects will experience several days, or even consecutive weeks, within the same "dream world". The actions taken by subjects within their dreams cannot be controlled and attempting to lucid dream while under RPC-056 will always fail. Information learned within RPC-056-1 has an approximately 40% chance of being accurate in the real world, and in at least one instance, a Researcher has experienced a dream wherein they were a member of the Board. Due to the potential security risks, testing is to be conducted carefully, and the containment protocol was updated to reflect this. Dream Details: Subject was in intimate relations with [REDACTED]. Subject reported the dream as a nightmare, stating intense disgust with the events portrayed, despite feeling happy within RPC-056-1 itself. The subject was given Class C EGs over Class B on request. Dream Details: Subject's circumstances were largely the same, save for that the Authority had granted permission for personal testing using RPC-016. The subject stated feeling joyous as he conducted tests alongside RPC-016-5, and later in the dream, experienced a birthday party for the instance. Dream Details: Subject was a CSD during a containment breach, and in the ensuing chaos, learned the security codes to several doors, as well as the location of [REDACTED]. Subject attempted an escape using this information, finding three codes to be accurate, before being apprehended, interviewed, administered EGs, and scheduled for disciplinary action. Dream Details: Subject was a researcher for a group with no affiliation with the Authority, seemingly a branch of the U.S. Government, making use of anomalous technology to recover further anomalous objects for use. Subject reported using technology at least ██ years past current capabilities, despite noting the year as the same in both the dream and reality. Of important note is the fact that the subject has described MST Foxtrot-9 Reider several times within instances of RPC-056-1, despite having no contact with the individual. Subject has also been noted to be a frequent target of RPC-056 despite only sleeping directly under it once. Subject has refused amnestics, citing she finds the dreams "interesting" and does not believe they contain any information useful or detrimental to the Authority. Dream Details: Subject was an entity fitting Authority classification for a Gamma Entity, capable of using its blood as a weapon, and broke out of containment. The subject reportedly demonstrated abilities matching no currently known anomalies and caused ██ casualties during the breach. Subject scheduled for additional psychological evaluations and given Class C EGs.